Welcome back to the Kramer Construction blog. 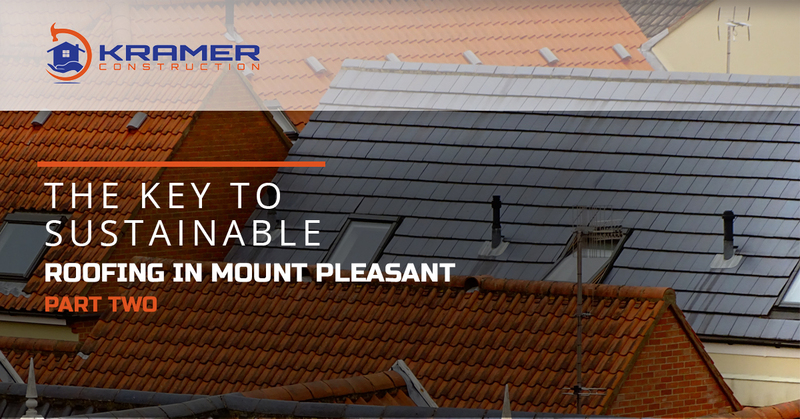 We’re proud to offer you a new look at the sustainable and durable options for your Mount Pleasant home’s roof. In our previous blog, we explored the ideas behind metal and clay tile roofing. In the following blog, we’ll start to evaluate the durability and therefore feasibility of how worthy a material is for your roofing system. While asphalt roofs are certainly the cheapest option around, they’re often the worst option when it comes to both longevity and maintenance. They seem rather indestructible and while it’s true that it is a versatile material that adapts well in many different climates, it can still be determined to be rather fragile in comparison to more sustainable and attractive options. 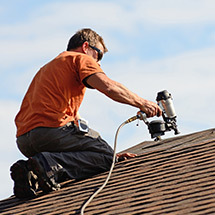 Initially, your asphalt shingles will not require a large variety of maintenance, however, after a short time, they’ll start to curl, crack and erode. You can even get mold and algae that can grow on them and actively attack the structural integrity of the shingles. This won’t happen with metal or even composite slate tiles. 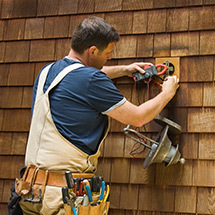 Those shingles are thick and require almost no maintenance throughout the lifespan of the roof. So while you may be saving money initially with asphalt shingles, their propensity for decaying quicker than the counterparts that last longer and look better renders the material altogether undesirable. 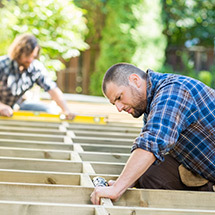 While wood shakes or shingles are not, necessarily, the greenest option available for your new Mount Pleasant roofing system, they are some of the hardiest and also most attractive. That being said, when put up against the cost comparison of either clay or slate tiles, they pale. We generally find the slate tiles not only are more attractive, recyclable and generally more desirable in general, they also last a very long time. To put it simply, there are some buildings in Paris and London that have slate roofing that has yet to be replaced. It’s the choice of castles for a variety of reasons. Similarly, clay tiles will require very little maintenance and will last an absurdly long time. Additionally, they are almost completely fire repellant. They’re nearly completely resistant to nature of insect damage as well. If we have a bad winter, the moisture won’t phase your shingles nearly at all and neither will less polite temperatures. They’re both absurdly beautiful when crowning any home and can have a life expectancy that can stretch to upwards of a 100 years. They’re not actual stone like their slate counterparts, but they’re awfully close. There’s no need to blindly search for the right roofing options in the dark. 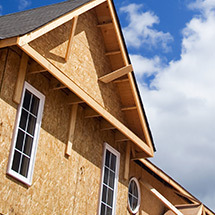 You can reach out to the professionals at Kramer Construction to guide you through how to acquire the proper roofing materials and get the roofing projects you need to be done for your home in Mount Pleasant. We promise a stress-free and relaxed environment for every purchase. After all, we’re merely trying to keep a roof over your head. Contact us now.